Tina Fey, Paul Rudd, Lily Tomlin, Michael Sheen, Wallace Shawn, Gloria Reuben. Admission looks as if it should be a comedy, especially with Tina Fey, so adept at impersonations and comic timing – she was the perfect Sarah Palin on television during the 2008 American elections. And Paul Rudd has done his fair share of comedies. So has Lily Tomlin. However, there are serious themes in Admission. Tina Fey portrays an official of the Admissions Board for Princeton University, New Jersey. Paul Rudd plays a wealthy young man who has travelled the world, supporting all kind of developments and buildings. He now runs a specialist school in New England and is eager for his star student, Jeremiah, Nat Wolff, who he thinks is the adopted son of Tina Fey. 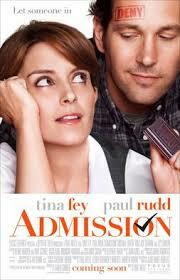 Admissions certainly has some funny moments, but Tina Fey is being abandoned by her partner of 10 years, Michael Sheen, gets tangled in trying to help Jeremiah to get into Princeton, which leads her into conflict with the authorities at the University. She also has some tangles with her eccentric mother, Lily Tomlin. It all comes to a rather serious crisis which means that she has to re-examine her life. The film is directed by Paul Weitz, a director of various films ranging from American Pie, About a Boy, and The Golden Compass. 1. The various meanings of the title: group considering admissions to college, admittance and no admittance, admitting realities? Each theme present in this film? 2. The cast, the background comedy, comic aspects, serious aspects? 3. New Jersey, Princeton, schools in New England? Campus, offices? Homes? The musical score? personality, quirky? The rivalry with Corinne? Her friendship with the director? Her methods for admissions, the interviews, the essays, her being behind in reading them? The director and his expectations? The clashes with Corinne? The other members of the board? 5. John, his application, knowing Portia in the past, his life, wealthy family, his travel, many countries, building, an idealist? His adopting Nelson? His life, setting up the school, the range of students, the curriculum? The invitation to Portia? Her coming, moving her lips and mouth to speak well, the session, the students reactions, her being put off? Chasing her with a document, her embarrassment, reaction, that Jeremiah could be her son? Meeting Jeremiah, observing him? 6. Nelson and his father, African, not wanting to travel more and John’s reaction? His liking Portia? His birthday party? 7. The visits to her mother, her mother’s eccentricities, relationship with her daughter, the background story of her conception, not knowing the father’s identity? Her mother as a hard case, not giving information about her surgery? The new breasts? 8. Jeremiah arriving at Princeton, her promise that he would be accepted, going to the dormitory, his serious attitudes, talking at the party? Portia turning up, her concern about him? Giving him more leeway? 9. The encounters with John, his kiss? Her relationship with Mark, ten years, his duplicity, leaving, his girlfriend having twins? His callow attitudes, seeing her in passing, trying to relate to Portia? Mark his girlfriend and her antagonism? 10. Her moods, up and down, trying to cope with the news about Jeremiah, researching, it seeming certain? 11. The celebrity Professor, his admiration for her mother, the relationship, her request that he come to see Jeremiah, write a positive letter? 12. The fair, the birthday, Jeremiah as ventriloquist? The professor being impressed? Staying the night with her mother? 13. The meeting of the board, the admissions, Portia and her talking in a friendly way with each of the members of the board, blocking the hostility with Corrine, the feminist perspective? The votes, her performance at the meeting, pushing Jeremiah? The reaction of the others? 14. Her changing of the documents, the director and his confrontation, firing her? 15. Jeremiah getting in to Princeton, talking with Jeremiah, his explaining his adoption, his adoptive parents and Portia meeting them? 16. Her adopted child not wanting to meet her for the time being? Interview for a new job, her settling down, a love of John – and a semi-happy ending?